Our bestseller-now better than ever! Enhancements to our regal replica of an antique corkscrew promise years of effort-free openings. A smooth-gliding, coated worm removes corks (natural and synthetic) with a simple pull of the handle. Inner workings and grapevine-relief casing made of lasting zinc alloy. Antique pewter finish. Mounts on your bar or our table stand. Size: 8-1/2"H This corkscrew is synthetic cork friendly. 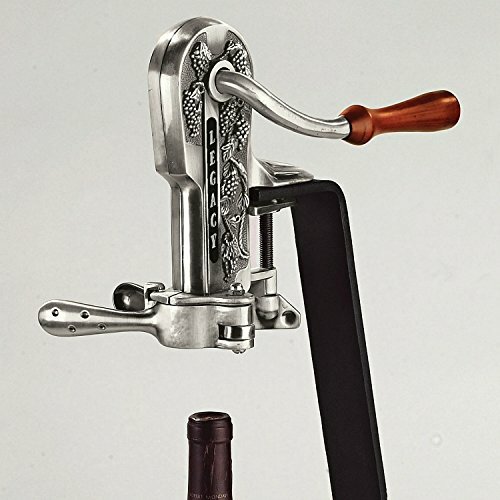 Barvivo Professional Waiters Corkscrew This Wine Opener is Used to Open Beer and Wine Bottles by Waiters, Sommelier and Bartenders Around The World. Made of Stainless Steel and Natural Rosewood.